Microsoft had a decent presence at San Diego Comic Con 2017, including a dragon to take pictures with (you could sit on a dragon for Middle Earth: Shadow of War!). But even with a dragon photo op, arguably the most fun was Crackdown 3’s panel starring Terry Crews. Crackdown and Terry Crews were made for each other. The Crackdown series has always been pretty ridiculous, but adding the craziness of Terry Crews should be amping this up another level. Agents have been able to max out Level 5 – until now. Level 6 was created specifically because of Crews’ Jaxon, who will be a playable character. Both the developers and crews knew they were made for each other. The developers thought about who would be an agent in real life and took a shot at reaching out to Crews. Crews knew about the game and was itching to be in the game. A different level of immersion. Crackdown 3 will take place over 10 years from the events of 2, so you’ll be thrown into a mostly new situation. You’ll be tasked with taking down a crime ring in a giant island where each major leader controls unique parts of the land. Technology will allow you to hack into the city to be very connected throughout the city, no matter where you are. The environment is also meant to be more of a living city than in past games that feature moving platforms, a monorail system, and enough space to move at your max speed much easier. Terry Crews flexed out of his motion capture suit. I mean there’s no much more to that point that isn’t in the sentence above this. He literally flexed out of his suit while filming, so they had to continually make the suit bigger. Ultimately, they found a way to showcase his arms. 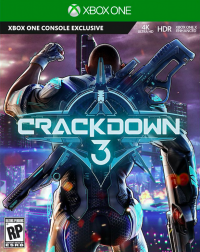 Crackdown 3 releases for the Xbox One and PC on November 7, 2017.